If you are itching to explore the world while also enjoying the convenience of all-inclusive cruise travel, now might be the time to start saving up for Viking’s recently-announced 161-day world cruise. The cruise line doesn’t want to leave anyone behind on this over-half-a-year venture and is offering departures from both the east and west coast. East coasters have the opportunity to enjoy the full 161 days, beginning in Port Miami December 14, 2020, while west coasters can enjoy the last 140 days of the adventure, beginning in Port Los Angeles January 4, 2021. Viking Sun in Bora Bora. Courtesy of Viking Cruises. 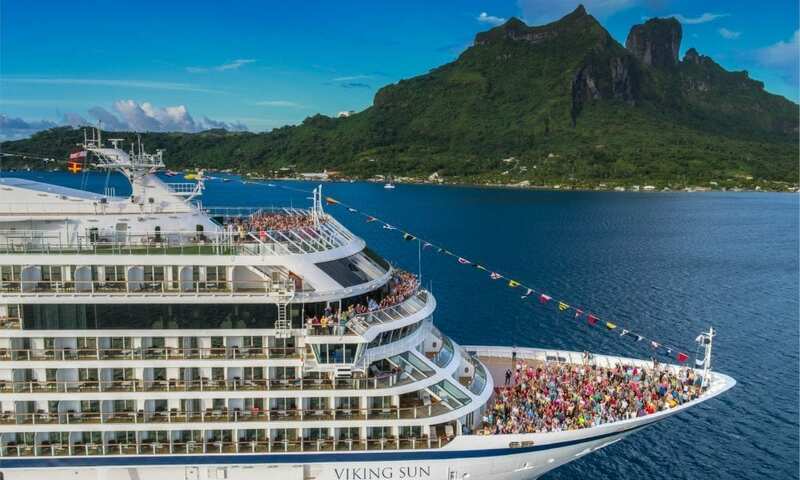 Though Viking Sun will be bringing its guests and crew across six continents and 75 ports, the most important stop will be in Honolulu and Nawiliwili — marking the line’s very first sailing to Hawaii (view the full itinerary here). Map of the destinations included in the world cruise. Courtesy of Viking Cruises. Another cool feature of this cruise, in particular, is that all 465 staterooms on the ship include a private verandah (and who doesn’t like more incognito opportunities to people watch? Or, of course, enjoy the calming views of the ocean). In order to go one step further to provide this cultural enrichment the chairman speaks of, the line will be offering educational opportunities to its guests, so they have the ability to really dive into the history and culture of the cities they are traveling to. Would you ever consider packing your bags for a half-a-year cruise around the world?